Description: Some variations of this game include a "collector's CD" that houses demos for Xenogears, Bushido Blade 2, Brave Fencer Musashi and Final Fantasy VII. 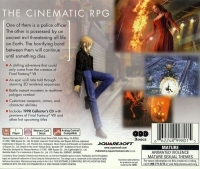 01-29-2014 TheHunterPersian Box Text THE CINEMATIC RPG One of them is a police officer. The other is possessed by an ancient evil threatening all life on earth. The horrifying bond between them will continue until something dies. 02-12-2012 maverickrenegade Description Some variations of this game include a "collector's CD" that houses demos for Xenogears, Bushido Blade 2, Brave Fencer Musashi and Final Fantasy VII. 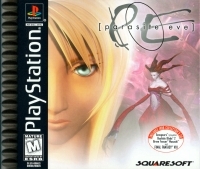 This is a list of VGCollect users who have Parasite Eve in their Collection. This is a list of VGCollect users who have Parasite Eve in their Sell List. This is a list of VGCollect users who have Parasite Eve in their Wish List.